This article defines & describes thermistors, thermal-sensitive resistors that respond to temperature changes, permitting very precise temperature measurement and the use of temperature to control devices such as room thermostats or process controllers. A thermistor is in essence an electrical resistor whose resistance changes in response to temperature. Here we explain the difference between Positive Temperature Coefficient (PTC) & Negative Temperature Coefficient (NTC) thermistors. We describe the use and placement of thermistors in room thermostats where they are used to accurately sense room temperature to permit thermostat control of heating or cooling equipment. We include thermistor temperature & resistance performance charts, and we list manufacturers and sources of thermistors. We also explain the difference between a thermistor, a thermocouple, a thermopile, and an RTD. Our page top photo shows how thermistors are connected on two different brands of room thermostat, the 3M Filtrete (above left) and the Honeywell CT2700 (above right). What is a Thermistor & How do they Work? Thermistors are sold in two styles: Positive Temperature Coefficient of Resistance (PTC), or Negative Temperature Coefficient of Resistance (NTC) - terms that describe the direction of change in resistance in response to temperature change. Our example thermistor performance curve chart (left) is for an NTC thermistor as we will explain below. For a positive or PTC thermistor, as temperatures increase the resistor's resistance also increases. Conversely, for a negative or NTC thermistor, as temperatures increase the resistor's resistance decreases. Here is RTI Electronic's definition of NTC thermistors. Thermistors are temperature sensitive passive semiconductors which exhibit a large change in electrical resistance when subjected to a relatively minute change in body temperature. Negative Temperature Coefficient (NTC) thermistors decrease in resistance when subjected to an increase in body temperature. Their extreme sensitivity to minute temperature changes enables them to perform many unique functions heretofore impossible with standard electronic components. Thermistor-type thermostats use a tiny solid-state electronic component, a type of resistor whose electrical resistance changes in response to temperature. 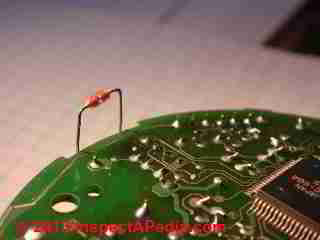 You'll notice in our photo of a thermistor found inside a Honeywell CT2700 Electronic Round Programmable Thermostat that the device is deliberately connected using long wire leads so that it can ride in room air away from influence by heat generated on the thermostat's own internal circuit board. Our photo (below) shows a thermistor used in a room thermostat. We had to take the thermostat apart and use our lab microscope to take this photo - this is a detail you won't normally see when installing a room thermostat. But it's there. The thermistor in our photo (above) is probably a Mini-Sensor™ thermistor unit sold by RTI Electronics as it matches that company's photos of their hermetically sealed glass encapsulated (DO-35) style thermistors. These devices are used in applications where the device has to tolerate severe conditions and wide temperature variations. The RTI Mini-Sensor™ thermistor can operate between -60 oC and + 200 oC. or -76 oF to 300 oF. This is an NTC or negative temperature coefficient thermistor with properties shown in RTI's Resistance/Temperature Chart at above left. As temperature increases (left to right on the graphs' bottom or X axis) the thermistor's resistance decreases (the vertical or Y axis on the chart) for this thermistor type. Our photo (left) shows that if you look closely at a room thermostat you may be able to see its temperature-sensing thermistor, as the device, while still protected from damage, will be poking out into air at one edge of the thermostat. This thermistor is used in the 3M Filtrete 7-Day programmable room thermostat. When a very small amount of power is dissipated in a thermistor, its temperature will be dependent upon the surrounding ambient. Therefore, its electrical resistance becomes a function of the ambient temperature, and may be used to measure temperature variations. RTI also explains how a thermistor is used to provide temperature control, such as provided by a room thermostat. By placing a thermistor in series with a relay coil and potentiometer ..., a simple temperature controller is obtained. The potentiometer will control the switching temperature. How can the thermostat manufacturer promise room temperature control within a narrow range, say +/1 1 degF? It's worth noting that circuits using a thermistor combined with a high gain amplifier can obtain sensitivity down to 0.005oC!. What about reliability? Thermistors, properly selected for the environment, can be quite durable. Nevertheless, some thermostats or HVAC equipment include a "safe-default" operating mode to keep the system working in the event that the thermistor should fail..
Our photo (left) shows the thermistor is used in the 3M Filtrete 7-Day programmable room thermostat after we disassembled the unit to display its circuit board. Watch out: don't try this at home. Most room thermostats are not intended to be disassembled to this level by the installer or homeowner. You risk breaking plastic tabs that hold the assembly together or damaging the thermostat's components. And you'll certainly void the thermostat's warranty. Thermistors have wide application in heating and cooling systems including, besides room thermostats, use in electronic controllers such as those that opearate an electronic expansion valve or EEV in some air conditioning and heat pump systems. at THERMOSTATIC EXPANSION VALVES, REFRIGERANT . What's the Difference Between a Thermistor and a Thermocouple or a Resistance Temperature Device (RTD) ? A thermistor is an electrical device, a thermally sensitive semiconductor resistor, whose resistance changes in response to temperature. Thermistors are made in a variety of ways including thin films (SiC). A thermistor can operate over a wide temperature range and indicates temperature by its resistance change. Thermistors are manufactured in a wide variety of sensitivities, operating temperature range, and forms including disc, chip, and hermetically-sealed glass encapsulated style devices. Herbst (1969) also described a thermistor constructed using thin film techniques. And Yoneda et als (1988) patented an alternative to the glass-encapsulated thermistor design. Thermistors generally have a smaller operating temperature range than thermocouples and RTDs. They are also less costly than RTDs or thermocouples which may explain their wide use in thermostats. A thermocouple is an electrical device that responds to temperature change by a change in voltage output. Unlike a thermistor, a thermocouple works to produce voltage output by connecting two dissimilar metals. When heated the effect of the two dissimilar metals in contact with one another is the production of an electrical current. Thermocouples are also produced in a wide range of forms and configurations, in eight or more calibration groups (B,E, J, K, R, S & T) with different temperature ranges including up to very high temperatures such as 3000 oF. In general we think that thermocouples are less accurate and less sensitive temperature sensors than thermistors. Our sketch at left, illustrating a typical use of a thermocouple at a gas boiler, is adapted from Weil McLain. An example of a widely used application of thermocouples is in the flame sensor for gas-fired water heaters, heating boilers, or heating furnaces (sketch above left). In a heating appliance application the thermocouple, when heated, generates a voltage in the 25mV range. That small voltage in turn operates (opens) the LP or natural gas supply valve. Loss of flame means loss of heat which will then, by stopping the production of voltage, close the gas supply valve, thus operating as a safety device. Thermocouples are not used on gas fired heating equipment if instead a "pilotless" or electronic ignition is used to ignite the gas flame, except in the case of tankless water heaters that rely on sensing water flow to ignite the flame. For safety tankless water heaters combine a water flow sensor with a thermocouple flame sensor. A widely used application of thermocouples is as instrument-connected temperature sensors such as the thermocouple attached to our ExTech DMM/VOM meter (photo at left). The thermocouple, simply suspended in air, gave an ambient air temperature reading (on our lab desk) in about one second after having been connected to the meter. A resistance temperature device or RTD is similar to a thermistor in that it is an electronic device whose resistance changes in response to temperature. An RTD is constructed using a metallic element whose resistance changes in response to temperature. RTDs are typically constructed by coiling very fine wire around a ceramic (or glass) central core. RTDs are classified in groups B, A, AA and DIN depending on the temperature range of which the device is required to operate. Typical RTD applications are in lab and industrial processes where temperature range measur4ements are needed between -200 oC up to about 850 oC. Question: how accurate are room thermostats & how accurate are temperature-sensing thermistors? What is the temperature uncertainty of ordinary commercial home thermostats used for controlling a hot-water circulating system? The thermostat in our photograph uses a thermistor for room air temperature measurement. As my smart home inspector educator Mark Cramer (Tampa FL) says, "... well, it depends"
That is to say the accuracy of room thermostats, all else being equal, depends on the thermostat technology. Older mercury bulb type round Honeywell wall thermostats were in my experience accurate to about 2 degrees or more of precision, and most "thermostat accuracy" complaints we found to be due to the thermostat installation location such as in sun, draft, or on a hot or cold wall. location in sun, draft, or on a warm or cool wall or other surface, as I cited above. By thermostat accuracy or thermistor accuracy as I discuss here, I mean the accuracy with which the temperature sensor measures the room air temperature where the thermostat or thermistor is located. Naturally the temperature sensed at a wall-mounted thermostat will rarely be identical to the air temperature or surface temperatures measured elsewhere in that room much less in that building. See TEMPERATURE RESPONSE of ROOM THERMOSTATS for details about things that interfere with heating or cooling system room thermostat accuracy. Continue reading at THERMOSTATS, HEATING / COOLING or select a topic from closely-related articles below, or see our complete INDEX to RELATED ARTICLES below. THERMISTORS at InspectApedia.com - online encyclopedia of building & environmental inspection, testing, diagnosis, repair, & problem prevention advice.